Kate Griffin is Prosperity Now's Vice President for Programs, providing strategic oversight for the organization’s asset building and financial capability programmatic agendas, including savings, homeownership and entrepreneurship. In her tenure at Prosperity Now, she has designed and led programs to scale asset-building strategies to reach more low-income children and families, consulting with community-based organizations and government agencies to improve practices and strengthen outcomes. Ms. Griffin has spent her entire career focused on financial inclusion and helping low-income families build and manage wealth. 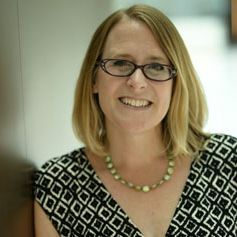 Prior to joining Prosperity Now, she worked internationally in the microfinance field, providing technical assistance to organizations in a dozen countries in Asia, Africa and Eastern Europe before joining Prosperity Now in 2012 to advance the goals of asset building and economic security in the United States. In leadership roles in Prosperity Now’s Savings & Financial Capability team from 2012-2015, Ms. Griffin oversaw Prosperity Now's work in the area of savings and financial security, including matched savings accounts that enable low-income children, adults and families to build assets. She has led Prosperity Now’s work to scale asset-building strategies within other large systems, such as TANF, Head Start, child welfare, child support, public health and other social services. Ms. Griffin was named the Vice President for Programs in February 2015. Prior to joining Prosperity Now, Ms. Griffin launched and managed the Solutions for the Poorest group at the Grameen Foundation. In that capacity, appropriate financial services were designed and made available to over 500,000 families in India, Ethiopia and the Philippines. Ms. Griffin also oversaw the East and Southeast Asia portfolio for the Foundation from 2006-2009. She worked extensively on policy environments for effective microfinance sectors while at the IRIS Center at the University of Maryland. She has also served as an adjunct faculty member at the Johns Hopkins School of Advanced International Studies (SAIS) and is widely published in the microfinance field. Ms. Griffin holds a B.A. in international studies from Kenyon College and an M.A. from American University’s School of International Service.